In their recent keynote, Apple touted their 40 years empowering educational initiatives through their technology. It started with the success of the Apple IIs in classrooms through the early 80s and then in 1984, the Macintosh was touted as a worthwhile but expensive hub for creativity which made it popular at universities. There were stumbles along the way with the eMate and Newton, but the first iMacs and eMacs (made specifically for schools) were popular particularly in special education. That’s about the time when I began to teach. I had never used an Apple computer before I began working for the New York City DOE back in 2005. That year I had a technology coach show me how to use GarageBand to create a song. It made it easy to get creative, so I dove in a made educational songs that I sang with students and soon I had them start making their own. That would lead to digital stories, digital game-based-learning, student film festivals, and more all made possible through Apple hardware and software. I had become fairly adept after a few years and in 2009, despite what I now view as a rather pathetic application video, I was accepted as part of the Apple Distinguished Educator Program. It’s been a wonderfully informative and beneficial experience that through the guidance of other ADEs in New York and outside of it, my instruction has continued to flourish. Since then the technology has changed greatly. I no longer have my iPhone 3G and the iPad came into existence and went through over a dozen upgrades. Despite all the changes though, there are things that Apple still does better than any other company and that’s empowering creativity and making learning accessible to all. In fact, about 4 years ago Apple tapped Leslie Schecht, the director of technology for District 75 (my district), to promote the work we’re doing for special needs students using tools like the iPad. We have since been recognized as an Apple Distinguished District. Apple’s announcement on the 27th sought to reaffirm their commitment to education, creativity, and privacy. Their focus was heavily on providing tools to empower project-based learning initiatives to make school more engaging and meaningful. That last piece about privacy is very important when we’re talking about student data especially in the wake of ongoing issues with companies like Facebook. Apple provides school and parent privacy guides to allay those fears. So here’s a look at what they announced. The event wasn’t really about offering new equipment but was more about demonstrating better ways for teachers to make use of what is available. They did offer an updated 9.7″ iPad that is now more powerful with an A10 chip and only $299 dollars for schools which is closer in price to the least expensive Chromebooks and Windows netbooks while still maintaining versatility of an iPad. It also offers support for the Apple Pencil which is a great stylus, but probably still a bit pricey for most classrooms. They also introduced other accessories like cases and a stylus from Logitech along with their own updated cases. They were also keen to show how the portability of the iPad makes it great for controlling other accessories like robotics kits and exclusive interactives like Beasts of Balance creative strategy game. The focus of the event on teachers and instruction was great, but it left out the role of equipment setup for tech teams and IT managers especially on a large scale. I’ll address that more below in what’s missing. Though it was left out of the announcement perhaps due to it being less inspirational or exciting, Apple does provide a full IT and Deployment guide. It starts with Apple School Manager, an all in one place to manage student and staff accounts, app management through volume purchasing, and device setup. Currently, it doesn’t offer complete device management on its own, so it requires connecting to an existingMobile Device Management (MDM) system. 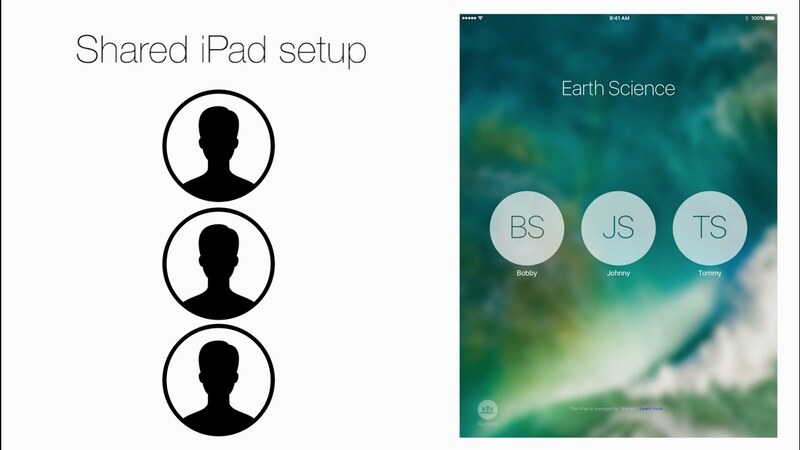 I use JAMF (recommended) and used Meraki in the past, but the guide also covers ways to set up iPads (and other Apple devices) physically via Apple Configurator. If you are using managed IDs, Apple increased the cloud storage to 200GB free. The best part about iPads are the apps which I’ll delve into more below, but it can be difficult to set up and manage iPads for a large class of students especially if you have to make sure everyone gets their assigned iPad. That’s also less cost-effective requiring a 1:1 setup. That is why Apple created Shared iPad where, like a Chromebook, students can log in with their Apple ID and get access to only their work and apps. You can even set up iPads to be set up as kiosks to be used for state testing. It will automatically disable the hardware buttons and features like dictation and the dictionary. As a teacher, I found the software to be as usual my favorite part of Apple’s announcement. It is their reliability, usability, and accessibility that make it easy to get teachers using the tools right away. And these updates will not only enhance student engagement but will make classroom management easier for instructors as well. Starting with the Apple brand updates there were major changes to the iWork suite mostly to allow for use of the Apple Pencil. In addition to creating drawings in your documents, teachers can annotate over student work in a manner that moves with document changes and is not just a stationary layer. That is huge for paperless grading and feedback. With the collaboration feature, the productivity apps that were always great for visually stunning projects now make it easier to create. What sets iPads apart as an instructional tool is the extensive collection of education apps, many of which (especially for special education) are exclusively on the Apple Store. They showed some great STEM apps as examples including one of my favorites from the New York Hall of Science. There were also updates to Clips and GarageBand with new educational templates and features like new title card posters including a blackboard and notebook and a new toy box sound pack for students. Apple’s iBooks is an amazing resource with enhanced digital stories that, in addition to basic tools like notes, lookup tools, and text to speech, it can include videos, a 3D interactive, assessments, and more. iBooks Author was a tool created for the Mac to help teachers and other professionals create those enhanced books themselves. One big issue though was that you couldn’t create those enhanced books directly on an iPad. That has now changed with the new advanced book creation update available for Pages on the iPad. It isn’t exactly the same as iBooks Author, but it does offer many of the features teachers would need. There are also a number of other digital story creation apps available in iOS. The new frontier in education is mixed reality which I especially love for my students who often struggle due to a lack of context for their learning. Augmented and virtual reality applications can help provide that context and Apple’s API has led to an expansion of app developers creating that content including some developers who may in your classroom. Apple trains students to program with AR in their Swift Playgrounds application. Some of the AR apps apple highlighted were Boulevard AR, which allows you to view artworks up close in class, and Free Rivers which allows you to create your own landscape and determine the environmental impact on your desk. The also promoted Froggipedia which offers the ability to fully dissect a frog and bring it’s translucent body to life in your classroom without enduring the smell of formaldehyde.. The biggest and most helpful changes are ones that will help teachers manage their students and the workflow. The Classroom app was a great idea that allowed teachers to guide and monitor student iPad use from their iPad, but it needed work. It has been quietly updated in the last year making it much easier to use. No longer is an MDM system required and teachers can set up a class easily. Teachers now can also lock students in an app, require teacher permission to leave a class, get summaries at the end of sessions, and drag and drop images and other content into student applications. Best of all is that the Classroom app will now be available on a Mac which will make it even easier for teachers to track student activity. While managing students’ on-task behavior has been helped through classroom, it didn’t help to manage all the work students were doing. You had to check their progress individually on each of the Khan Academy, Quizizz, or Tynker apps. Who has time for all of that? We want to engage our students with the great apps, but we also need data to guide it. In walks Apple with the Schoolwork app that allows you to share content, track app progress, create grouping and differentiation, collaborate, provide feedback, send announcements, and easily view the progress of your whole class or an individual student. Some of the apps already integrated in addition to those above included Kahoot, IXL, GarageBand, Nearpod, Socrative, and iBooks. It makes the iPad a much more enticing educational tool since they are offering teachers the one thing they really need – more time. Apple’s first offering in recent years in terms of content was their Everyone Can Code program which is full-fledged computer science curriculum for K-12 students using their Swift Playgrounds software as the bridge. Swift Playgrounds can now be used to program robots, drones, and make music. The curriculum works with students in apps and offline to develop the problem-solving skills they will need in all other areas of their education as well. You can find more information in the Getting Started with Code Curriculum Guide and Swift Playgrounds Curriculum Guide which are available in several languages. Apple is taking their curriculum development to the next level with Everyone Can Create which is meant to focus on creative development in the classroom using music, photography, film, music, and drawing. It is a project-based learning initiative meant to make all subject areas, not just the arts, more visually accessible, engaging, and applicable to a student’s life experience. Studies continue to show that presenting information through multimedia content increase student access and retention of information. Apple is using their tools to make that process easier for teachers and students. One of the best things Apple offers teachers is ongoing help in learning to use their offerings. No matter how amazing a tool is, it is worthless if the teacher doesn’t know how to use it. The Apple Teacher Learning Center provides training, certification, and lesson ideas and materials for teachers along with the latest updates from Apple Education. If you need a more hands-on touch, they offer Teacher Tuesdays where you can meet and collaborate with other like-minded educators and Apple professionals to learn how to make the most of what’s available in your class. Anyone can also attend any of the Today at Apple training offered regularly at Apple stores on topics for kids, artists, and educators. Despite my connections over the years to Apple education, I am not bound to them and I perfectly fine with communicating areas I think Apple needs to address. In the wake of Apple’s recent announcements, I heard some complaints that they were promoting visual content over student writing. I disagree though. In the examples they shared (though graphically/video heavy to show what’s possible), they still showed a lot of typed and handwritten (with the Apple Pencil) content in the final portion and planning stages of project-driven learning with the elementary students that they seemed to emphasize. Writing is a crucial skill, but those with physical/visual impairments often ‘write’ via their voices. Mastery of a subject and relaying it through a coherent narrative needn’t require pencil and paper (though their value remains). A big part of the presentation covered ELLs and struggling students and finding a means to remove those roadblocks and the multimedia content breaks down those barriers. Also, where would the interest be in showing a 40-page thesis paper with footnotes? The actual areas where I would like to see improvement is in their MDM system. I would love it if Apple would buy out a company like JAMF and make it better and integrate it wholly into their infrastructure. And while they’re doing that they can buy out one of the major textbook companies so that their efforts to remake the publishing industry the way they did the music industry. I’d also like to see some major offering s in mixed reality, but we can hold off on that one until we learn more about the implications. So there’s definitely room for improvement, but there are many things to be happy with about APple’s continuing efforts as a force to innovate in education.